If figuring out what size or type of shipping container to purchase has you stumped, don’t fret. The following basic tips can help you home in on the modifiable shipping container that best meets your industrial, construction, storage, mobile office, or living space needs. Tip No. 1: Start by focusing on standard shipping container sizes. * If you DO have an unusual modified shipping container application, contact us as there are many other sizes available or we can even create a container in any size for you. We simplify the process for you. Tip No. 2: Get to know common shipping container lingo. Military van container or milvan. For more container insight, visit our Shipping Container Basics page. Tip No. 3: Dive deeper into uses for common shipping container types. Shipping containers were designed to serve a variety of needs. So it’s important to find out the original, intended use of the shipping container you’re considering, where it’s been, and if it is suitable for your application. We’ve included the most common shipping container types below and also explain how these terms apply to the containers Falcon modifies. Dry containers vs. refrigerated containers. Falcon only modifies dry containers, however climate control systems are a popular option our clients choose. One-trip containers. As the name implies, one-trip containers have only traveled from overseas (Asia or Europe) to the U.S. once. 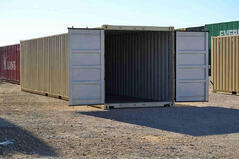 We recommend and sell one-trip containers for most customer applications, especially work and living spaces. Used containers. These containers have traveled back and forth overseas several times. Falcon doesn’t recommend used containers for most applications beyond storage. Cargo worthy containers. These containers have been certified to transport cargo on a ship. 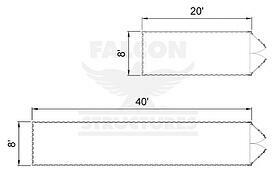 The term doesn’t apply to Falcon containers, since our clients’ modified containers won’t be traveling by ship. Wind and watertight containers. Because we purchase containers with modification in mind, Falcon guarantees all containers as wind and watertight for one year. If you’re ready to weigh your options, start by checking out our Modified Shipping Container Products page to review our standard products by category (Storage, Workspace, Living Space, Industrial, and Custom). Then, feel free to reach out to us for insight or a quote. We would be happy to answer any questions you have regarding your shipping container application. To speak with one of our friendly Falcon representatives, give us a call at 877-704-0177 today.